It has been an enjoyable month of training, competing and socialising! It started off with a night away and a trip to The Equerry Bolesworth International Horse Show to watch the dressage classes on the Thursday with my great friends, Vicky and Kate. We very much enjoyed watching and not riding, followed by a lovely evening meal. Annabelle has celebrated her first birthday this month too and is now a proper toddler. It feels strange that she doesn’t feel baby-like any more and loves her riding and now, thanks to Kate Brown, has her first riding hat and pony on the way….watch this space! I was thrilled to receive our GB call up for Hartpury. Out of the 92 names on the list they could only pick 18 and I was to be one of them, although on seeing my name against the professionals, I felt like I needed to up my game a little! We decided to go down a few days before and do a Prix St Georges in the Premier League classes as a warm up as generally Bodyguard gets more confident the more he does in the arena. This was to haunt me for a while and didn’t work in my favour. Unfortunately for me, on movement five the bell rang. Knowing I had not gone wrong, I walked down to C to be informed by the judge that he thought Bodyguard was lame, so eliminated me. For the first time in a long time, I burst into tears as I didn’t feel any lameness at all, in fact he was feeling the best ever. Although I agreed there were a few balance issues on the turns, there certainly wasn’t any lameness. For my own piece of mind and the fact I had the CDI International Trot up a day later, I got a vet to come out and inspect Bodyguard. After watching my video, flexion testing him and trotting him up on the hard surface, no lameness could be found so we carried on as normal. 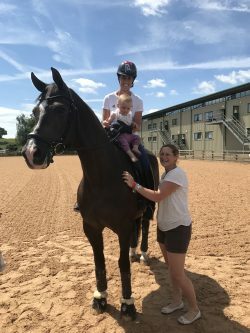 A welcome distraction came when Annabelle got to have a sit on Valegro with Charlotte Dujardin – definitely one for the family album! Much to my surprise, the same judge then gave me the highest score of the five judges’ scores on the first day of the International. With all this happening, I didn’t ride the best of tests on the first day as in my mind I was waiting for them to ring the bell. However, there was no bell and we finished on 65.7% to end up in 17th place out of 32 which, considering I hadn’t ridden as confidently as I could have done, and this was an International not just a National competition, I was really pleased with him and our placing. The following day, I decided I needed to ride with more power and more commitment and as our allotted time was not until 5pm I over-cooked it and got him too tense which showed in his relaxation and submission marks. We ended up on a disappointing score but there were lots of positives in the test and a few eights but the fours and fives for tension brought us down. I am still over the moon with him and how far we have come. Gaining our GB badge was one of my biggest life ambitions. Now I have to aim for the next goal which would be a top ten placing, plus we are stepping up the levels now to Inter 2 and Grand Prix so it is all new to both of us!